Edith is currently a Junior at Eastern Michigan University, majoring in Biology/Zoology. 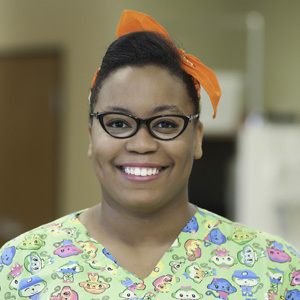 She has been an emergency veterinary receptionist for approximately 3 years and has also worked as a technician assistant/receptionist for small animal day practice veterinarians for about 2.5 yrs. During high school, Edith job shadowed a local vet and fell in love with the job. She loves helping pets and educating clients on appropriate medical care. "What I like most is hearing pet parents' funny stories about thier animals. I like to think I bring a great attitude and fun spirit to the AEC team!" Edith eventually wants to go to veterinary school (preferably MSU). She doesn't have any personal pets at the moment, but she visits her parents crazy German Shorthair Pointer mix, Buddy, pretty often.